Civil An-12 aircraft were closely similar to their military siblings. Naturally, first of all their landing gear was modified and their armament were dismantled (the tail gun position sometimes remained, but with a so-called 'end-cap' installed). The пао-3 radar was taken out as well, and PO3-1 radar was installed in its place for the purpose of earth surface observation. This radar equipment had somewhat smaller dimensions, which is why the radome on the civil An-12 had a different shape as well. The Soviet Ministry of Civil Aviation used the civil version of the An-12 for solving various problems - delivery of food supplies to remote and inaccessible regions of the country, container transportation, and delivering aid to countries with the 'socialist way of development' (mainly in Africa and Latin America). In 1966 Aeroflot opened the first international cargo route between Moscow-Riga-Paris, and in 1969 another one between Vladivostok and Amsterdam. The An-12 was used on this route for a long time. At the start of the 1990s most military An-12 aircraft were taken out of VVS service in the now-dissolved Soviet Union, and sold to numerous newly created transportation companies. A significant quantity of An-12 aircraft were exported (mostly to Africa) where they remain in service today. However, quite often these machines do not satisfy modern standards and even expose flight crew to certain risks. 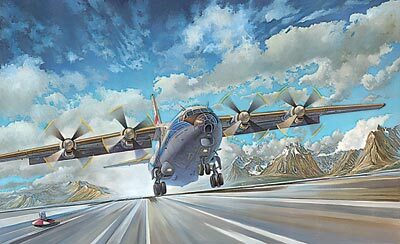 The majority of An-12s were built in the 1960s and should now be out of service; however at the present moment the Experimental Construction Bureau named after Antonov is considering extending the flying service of these aeroplanes until 2010. An-12BK, Aeroflot airlines, early 1960th. An-12BK Aero Vis Ltd Cargo freights, Ukraine, 2006. An-12BK Aircraft of the unidentified Ukrainian Aircompany, 2007. Capacity Up to 90 paratroopers; APC, SPG, vehicles or freight.